Teachers and parents who read aloud to children have long known that good stories have the power to captivate the most restless of kids. Before books became the main means of conveying information, spoken word was the vehicle for sharing culture, tradition and values. The continuation of those experiences depended on the attention of the listener. Being able to listen well and remember what was said was an essential part of the oral tradition. Research underscores the link between listening and literacy. Work by Betty Hart and Todd Risley found that the vocabularies of three-year-olds were predictive of their language and reading skills at age ten. Studies carried out at Stanford showed a gap in vocabularies between children of the well-off and those with lower socioeconomic status is apparent in children as young as 18 months. And professor Nina Kraus at Northwestern University, who explores the complexity of sound processing in the brain, has found that a variety of factors, including income level and a mother’s education, play a role in how well children process sound—which in turn affects reading ability. Educators like Mary Ann Scheuer, who has taught with and promoted audiobooks in the classroom -- and began her own blog Great Kid Books -- sees how exposing kids to the spoken word via rich stories improves literacy. While books require readers to decode every word, stories told aloud free up the listener to connect with the story and the storyteller. “It provides an emotional connection to the narrator,” Scheuer said, which in turn motivates kids to continue listening. Well-told stories can also fill the vocabulary gap for those students who haven’t been exposed to a rich array of words over their lives. For children with already abundant vocabularies, listening to stories with more complex language expands their stable of words and exposes them to more sophisticated stories. Scheuer said her 8th grade daughter, who struggles with ADD, listened to Walter Isaacson’s massive biography of Steve Jobs—something she would have given up on in written form—while doodling in a notebook. “It pulled her in and kept her attention,” she said. For Ashley Alicea, a third grade teacher at W.J. Gurganus Elementary School in Havelock, North Carolina, audiobooks have been most transformative for those kids who hate to read. “It almost seems to open up a world of reading for them,” Alicea said. She encourages kids to make a movie in their minds while listening—to visualize the story they’re hearing. Absent the need to decipher each word, reread for content, and then picture the story, these struggling readers listening to stories soon fall for the book itself, and are able to participate in class discussions about plot and character. Many kids go on to read the books after hearing them read aloud. And audiobooks help all readers improve their fluency: Alicea sometimes plays a paragraph, and invites her students to read it aloud and try to match the narrator’s pacing, tone, and expression. “Every modality and learning type can benefit from audiobooks,” Alicea said. Audiobooks and podcasts are popular ways of bringing stories to students, and each mode brings something unique to the class. William Weil, who with his wife founded the audiobook steaming service for schools, Tales2Go, said that even kids surrounded by articulate adults benefit from hearing the complex words and sentences found in novels and nonfiction; correct usage is often lacking in ordinary conversation. Further, audiobooks come with “transcripts”—the book itself—which help support literacy. Finally, advances in digital technology allow teachers to bring audiobooks to the classroom without depending on dated cassettes or CDs: the site Tales2Go allows teachers and schools to buy instant, simultaneous, and unlimited access to audiobooks, letting students listen to stories on multiple devices. Podcasts have their own virtues. Monica Brady-Myerov, who provides NPR podcasts to teachers through Listenwise, said that hearing real people tell their stories triggers an emotional reaction among listeners. “Empathy comes from listening to other people tell their story, which improves learning,” she said—the same reason author Malcolm Gladwell gave for starting his own podcast: to “move people emotionally.” Also, unlike audiobooks, which started on paper and were written to be read, podcasts are created to be heard. “That’s what moves the story along—the flow; it sounds better,” she said. Podcasts also often have the advantage of being shorter. What most podcasts don’t have, versus audiobooks? The editors or publishers who provide oversight. “A lot are provided by people who are just interested in the subject,” she said. This is fine, Brady-Myerov adds, except that the “tsunami of podcasts” makes it harder for teachers and parents to discern the legitimate from the looney. 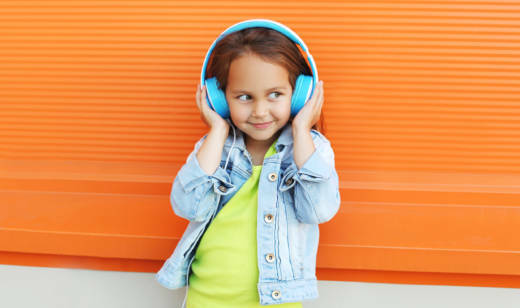 Earsnacks – An exploration of various topics, using kids’ voices, expert opinions, and music. Welcome to Nightvale – A dark and funny exploration of the fictional town of Nightvale. The Radio Adventures of Eleanor Amplified– From WHYY in Philadelphia, this show follows young journalist and adventurer Eleanor, who goes from space to sea. With sound effects, lots of voices, and music. Lore – Soon to be a TV show, this podcast examines the origins of vampires, witches and other grim historical tales. RadioLab – From NPR, documentary-style examinations of real events and problems, told with music. Revisionist History – From Malcolm Gladwell, close looks at historical events that were either overlooked or possibly misinterpreted. Are there other audiobooks we should know about? Please add to the list in the comments section below.